The first time I visited the small mountain village of Willoc, near Ollantaytambo was about 12 years ago. Coincidently, my cousin Kate Jones spent a semester from the Lakeside School in Ollantaytambo and spent some time with a family in Willoc about twenty or thirty years before I showed up. This was before I knew where Peru was. She sent a photo of her with her host family in Willoc, which I had on my desk for a number of years. Then when I finally went Willoc, and recognized the local dress, I wondered if Willoc might be the place that Katy ended up. I called her from Peru to solve the issue, and yes it was. Another year in Willoc, I tracked down her family. I’m headed there again in a few days, and will take a copy of the picture with me again to give to them. On our Peru’09 program we again visited Willoc, and were shown a demonstration from start to finish of how the weaving is done – from shearing the wool to drop-spindle making the yarn, to dying the wool and finally the back-strap loom weaving. While there we also were treated to a traditional meal and were shown the varieties of corn that are grown on the surrounding hillsides. The diffierent types are used for the fermented Chicha drink, toasting, cornmeal and other specialties. 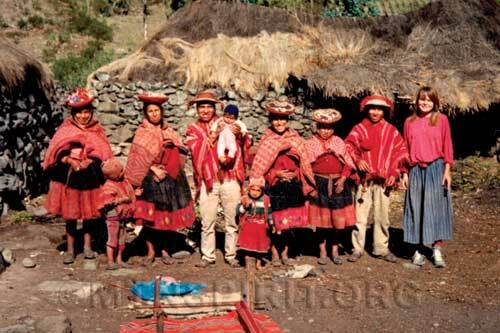 As in other places in Peru, visitors are occasionally brought to small mountain villages. Mountain Spirit Institute limits our group size to a maximum of eight participants. Sustainable Travel International has guidelines on how to visit such communities as Willoc. We feel at this point, there is a benefit to both the visitors and the villages for such visits, but they must be organized and done with care. One example, I always brief my particpants at the program start, and remind them of low-impact travel techniques, such as respectful use of the camera, matching voice volumes to that of local inhabitants, and follow cues from our hosts. Our good friend, Anna Sequeros, a former president of the woman’s organization in the region has really worked wonders in bringing equality to village women in the area. More on that in another entry.